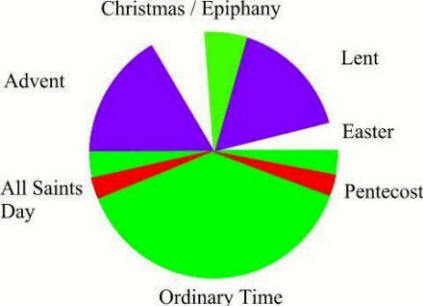 Why Follow the Christian Calendar? While following the Christian calendar is not in my view the best primary means of growing in discipleship, I've chosen to explain some aspects of it because of its prevalence in the institutional church and history. It was initially a primary means used by the church of reminding, particularly those largely illiterate before the invention of the printing press, of foundational truths and events in the Scriptures. What Does the Christian Calendar Remember? The Christian calendar does not begin with Creation or the beginning of Scripture but with the promise of the Messiah (Advent) in anticipation of the coming of Christ. After Christmas it follows the life of Christ through the celebration of His Sacrifice (Good Friday), Resurrection (Easter), Ascension, Pentecost and other important events celebrated by those who follow Him. There are many Scriptural events, such as our expectation of Christ's return, not covered by this calendar but those that are celebrated are centrally significant. There are additional days which, while not on the church calendar, were reformed from pagan festivals to a higher form such as Valentine's Day.